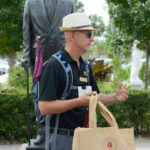 Taste a variety of delicious selections of gourmet cuisine from area restaurants during a 3-hour walking culinary tour. Guests will enjoy generous servings and exclusive visits from restaurant managers or chefs. Water is provided at each stop but guests are welcome to purchase other beverages separately. Key Culinary Tours’ entertaining guides also share insight of the area’s unique history and cultural influences. Food and gratuities are included in the tour. 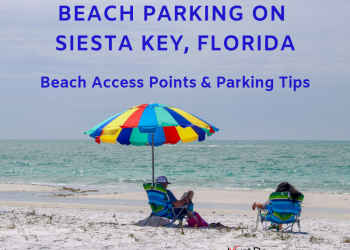 The 3-hour tours are offered in St. Armands Circle, downtown Sarasota, Venice, and Lakewood Ranch. 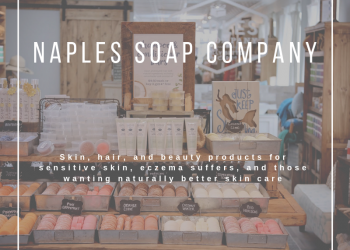 Discover Venice, Florida’s architecture and history with stops at restaurants and specialty shops. The 3-hour Venice walking culinary tour is offered Tuesday through Friday at 2 p.m.
Savor St. Armands culinary tours are offered Tuesday through Saturday at 3 p.m.
Visit four restaurants and learn fun historical and architectural information about downtown Sarasota each Tuesday through Friday at 3 p.m. International Flavors of Sarasota tours are also offered downtown Sarasota Tuesday through Friday at 11 a.m.
Stroll along Main Street in Lakewood Ranch while your tour guide shares the history of the area. 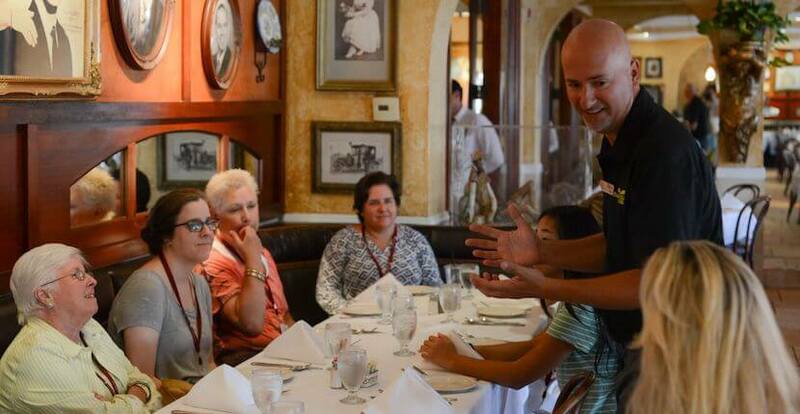 This 2 ½ hour tour includes stops at Main Street restaurants and is offered Wednesday through Saturday at 3 p.m. 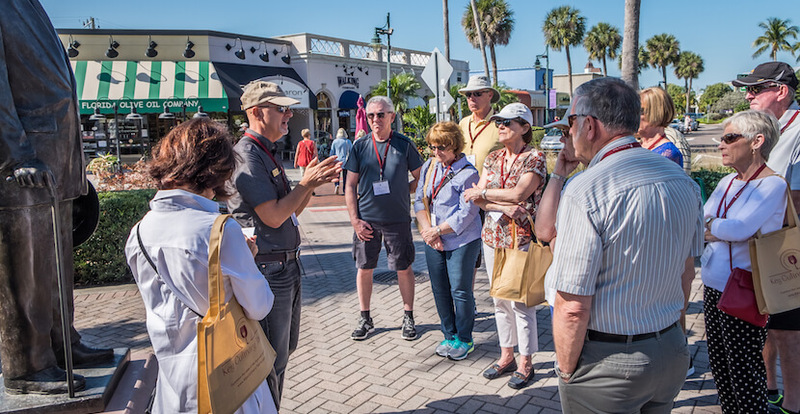 Explore Lido Key on a guided culinary bicycle tour with stops at four restaurants on St. Armands Circle. 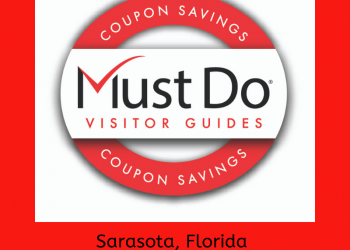 Tours are offered on Friday at 9 a.m. in partnership with Sarasota Bike Tours, Inc. 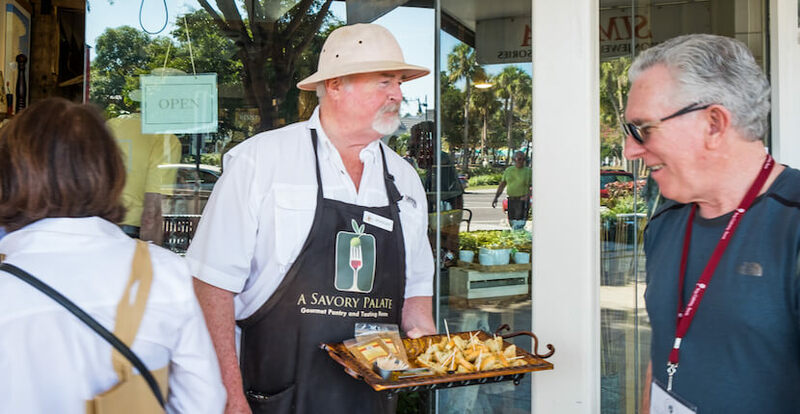 Experience the downtown Sarasota Farmer’s Market on a unique Chef led culinary tour! Guest have the opportunity to learn what to look for when purchasing the best produce, cheeses, fish, and other market ingredients before proceeding to a nearby restaurant for a private Chef led cooking demonstration. The tour concludes with lunch and a glass of wine. This 3-hour tour is offered on Saturday at 9 a.m. The leisurely Happy Hour tours offer a sampling of libations and light bites. Enjoy one drink and snack per stop (gratuities included). Your fun-loving guide will share a few interesting facts and a little history about how Florida managed the movement and consumption of alcohol during prohibition. 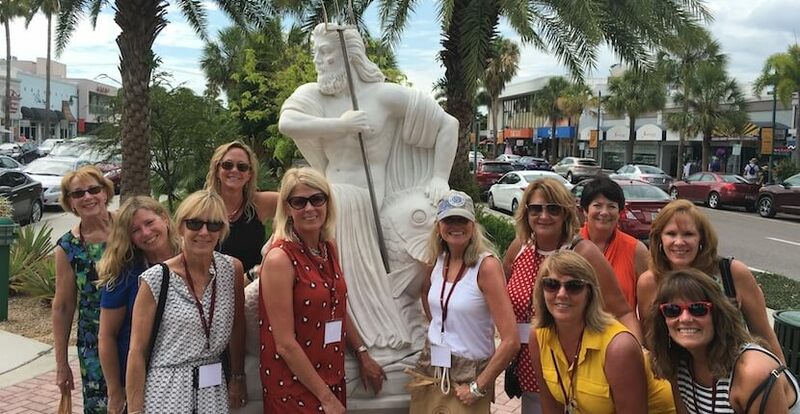 The 2½-hour tour departs from the Neptune statue in front of the Columbia restaurant on St. Armands Circle. You must be 21 years old with a valid ID. Happy Hour Tours are offered Wednesday through Saturday at 4 p.m. Enjoy a leisurely Sunday afternoon tasting a variety of meatballs and other foods. Your costumed guide will share stories and songs about meatballs on the 3-hour tour. 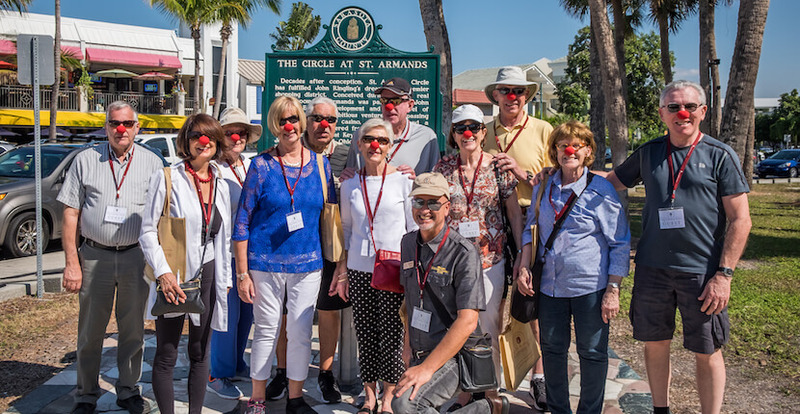 Tours are offered Sunday at 1 p.m.
St. Armands Circle 90-minute walking sightseeing tour (without food). Learn about the 49 classically designed statuary featured throughout St. Armands. Sixteen of the statues were purchased by John Ringling in the 1920’s supporting his desire to bring art and culture to the city of Sarasota. Tours are offered Thursday, Friday, and Saturday at 10 a.m.
Read Key Culinary Tours featured blog article here! Private tours are also available. All tours are offered rain or shine, wear comfortable shoes and dress weather appropriate. Reservations are required.